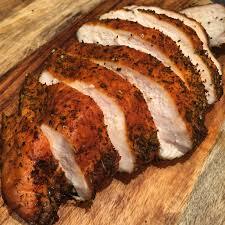 Simple recipe from BBQ Class with Chris Marks of Three Little Pig’s Rubs & Sauces on how to slow smoke boneless skinless chicken breasts to get a great flavor that will satisfy everyone’s tastes. Mix the brine in large bowl or bucket until sugars dissolve. Add chicken breasts, to brine, pressing to submerge. Cover and refrigerate for 4 Hours. Lightly apply Extra Virgin Olive Oil to both sides of the breast. Apply Three Little Pig’s Championship Rub to both sides of the breast. Wrap the Thin cut bacon around each breast to help tighten and form. Prepare Smoker with All Natural Lump Charcoaland set smoking temp to 225-250 degrees for the breasts. Add your choice of flavor wood (Cherry) to the smoker, cook until breast is firm to touch (160 degrees) usually 1 to 1 ½ hours. Remove breast and cut against the grain for best results and bite for tenderness. This entry was posted in Meats, New Products, Recipes, Uncategorized and tagged 3 little pigs, America’s Best BBQ, bar b que, barbecue, barbecue rubs, barbecue sauces, BBQ, bbq chicken, bbq class, bbq grilling, BBQ Rubs, BBQChampion, Best BBQ rub, Best bbq rubs, Best BBQ Sauce, Boneless Skinless Chicken Breasts, chicken, Chris Marks BBQ, dry rubs for meat, great bbq rubs, grilled chicken, Kansas City BBQ, meat rubs and sauces, Memphis BBQ, North Carolina BBQ, pork rub, rubs for grilling, smoked chicken, Three Little Pig's Championship, Three Little Pig’s Brine, wet brine, World Champion BBQ. Bookmark the permalink. Thoughts on adding sauce. Add sauce while on the smoker, or after they come off?